Former England captain Rio Ferdinand and current England boss Roy Hodgson have been named on the Football Association commission set up to improve the national team's fortunes. The appointments follow criticism of the group's all-white, all-male make-up by Heather Rabbatts, the FA's only female board member. Manchester United defender Ferdinand, who quit international football in May after winning the last of his 81 caps in June 2011, is the first non-white member of the 10-person panel. The 66-year-old Hodgson, who has a wealth of managerial experience both in this country and abroad, has just guided England to the 2014 World Cup finals in Brazil. On Saturday, Rabbatts accused the FA of letting down black and ethnic minority people with the make-up of the commission. Following the new appointments, she welcomed "a degree of diversity" but said questions needed to be answered to a make the body "truly credible". FA chairman Greg Dyke said the 34-year-old Ferdinand, who has won six Premier League titles with Manchester United, was always a target for the panel. "We have been speaking to Rio and Manchester United for some time about him joining the group, before we named the other members of the commission," said Dyke. "However, as he is a current Manchester United player, we needed to be sure that Rio had the necessary time to fully participate on the commission and not impact on his day job. It has been agreed he does. "As a current player with forthright views and opinions on the game, we can look forward to Rio providing significant insight and experience." Dyke has previously said the commission would have no more than 10 members, although it is not yet confirmed whether the line-up is complete. The group was set up to consider how to increase the number of England-qualified players appearing for the country's top clubs. "This is the latest twist in FA chairman Greg Dyke's look at how to improve the fortunes of the England football team. "Roy Hodgson and Rio Ferdinand are two heavyweight figures but perhaps, more significantly, Ferdinand will become the only non-white member of the commission. "Some may accuse Dyke of tokenism after accusations he mishandled the set-up of the commission. "He will now hope he has silenced his critics and it will be fascinating to see what Rio Ferdinand will bring to the commission." Dyke, who has set England a target of reaching the Euro 2020 semi-finals and winning the 2022 World Cup, said he delayed announcing Hodgson's appointment until the conclusion of England's qualifying campaign for Brazil. "It is important Roy can offer his views as the current manager of the national team and share the knowledge he has gained when working for many years in a number of countries," said Dyke. Jamaica-born Rabbatts, 57, wrote a letter to Dyke and fellow board members to complain about the commission's "lack of diversity". She claimed she had no choice but to go public as there had been a "refusal to understand" her position in private. Responding in an open letter, Dyke said he was "sorry" Rabbatts felt the need to go public and was "surprised" at the comments of his former board colleague at the BBC, where he was director-general from 2000 to 2004. In a statement on Sunday evening, Rabbatts said: "While I can appreciate the appointment of Roy and Rio and of course welcome a degree of diversity, there are still questions which remain about the work and role of the FA commission. "The issue of real diversity, and the insight that can bring, is still not fully resolved nor are the exact terms of reference of the commission and the continued absence of the Premier League from its membership. "Greg Dyke was right to say that this project was the FA's flagship for the future well-being of our national team and it is essential that it is overseen by a body that is truly credible and has the trust and confidence of the whole of football. "This is still not the case. Today's announcement is a start, but there is a lot more work to do." 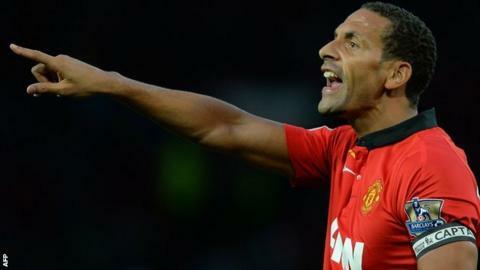 Ferdinand played for England at the 1998, 2002 and 2006 World Cups. He missed the 2010 tournament because of injury and was subsequently left out of the England squad for Euro 2012 by Hodgson. The centre-back's absence from the tournament avoided a potential conflict with John Terry, who at the time was awaiting trial over allegations he racially abused Ferdinand's brother, Anton. Terry was cleared of the charge at Westminster Magistrates' Court in July but later found guilty by the FA. In October 2012, Hodgson denied telling London Underground passengers that Ferdinand's international career was over. Ferdinand was recalled for the World Cup qualifiers against San Marino and Montenegro in March, but later withdrew because of a "pre-planned fitness programme" before announcing his international retirement two months later.